I’ve been trying to get myself out of the “blahs” lately, plus trying to get myself a bit more organized. So I came up with a plan to try to categorize my posts. You see, I don’t always have something new on the hook every week to show you – sometimes my best might be once a month! However, I’d prefer you not get bored and drop me altogether, so I’ve come up with categories of posts to find fresh material that will keep you interested. Sounds good anyway, doesn’t it? Crochet for Baby has a video of how to do the stitch plus an extra video on how to do the last row of single crochets here. If you do a google search, I’m sure you’ll find many more tutorials on this wonderfully textured stitch – Enjoy! 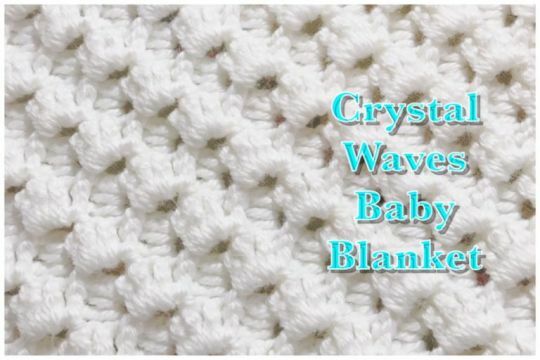 If you can’t see the photos, please go to my" blog":https://thecrochetedbutterfly.blog/2019/02/03/crystal-waves-crochet-stitch/ to see them.